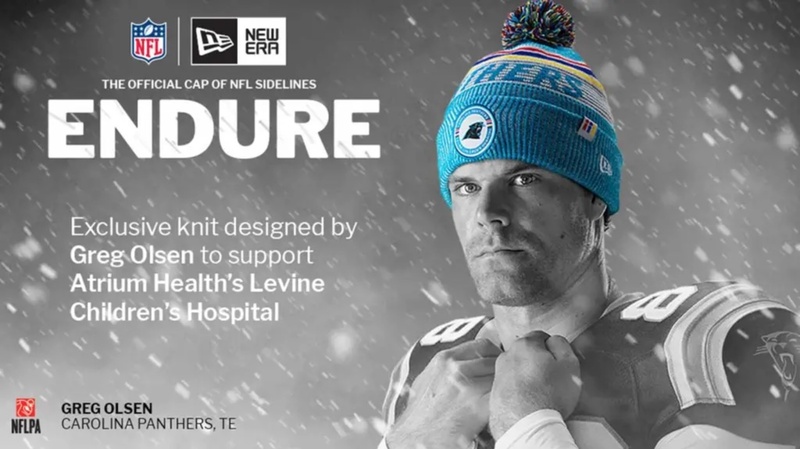 The Carolina Panthers, New Era Cap, and Levine Children’s hospital have announced the Limited Edition ‘Carolina Panthers Sport Knit’, designed by Greg Olsen, a new knit beanie that was available for purchase in Carolina’s game against Seattle on Nov. 25. The beanies sold out within minutes online and before kickoff in the team store. Olsen and Levine Children’s Hospital collaborated to establish The HEARTest Yard initiative, a family service program administered by Levine Children’s Hospital in Charlotte. The cutting-edge program provides families of babies affected by congenital heart disease with a multitude of services including in-home, private nursing care, physical therapy and speech therapy among other benefits. For more information on The HEARTest Yard, visit http://www.r4r.org.